Dr. Jake Frank is a trueborn Alaskan who grew up in many areas of Alaska, Montana, and Wyoming. He attended the University of Wyoming (Go Pokes) in Laramie where he received a Bachelor of Sciences Degree in Kinesiology and Health. Dr. Frank then moved to Oregon to receive a Doctorate in Optometry at Pacific University College of Optometry, where he met and married his wife Dr. Kara Reynolds, OD. After graduate school, he added to his didactic knowledge and gained invaluable experience by completing a residency in Ocular Disease at the Eye Foundation of Utah in Salt Lake City, Utah. He moved back to Alaska in the spring of 2010. He and his missis quickly decided that the valley is the perfect place to settle and grow their roots. Although he enjoys providing care to people of all ages, he has special interests in the treatment of glaucoma, retina, and contact lenses. 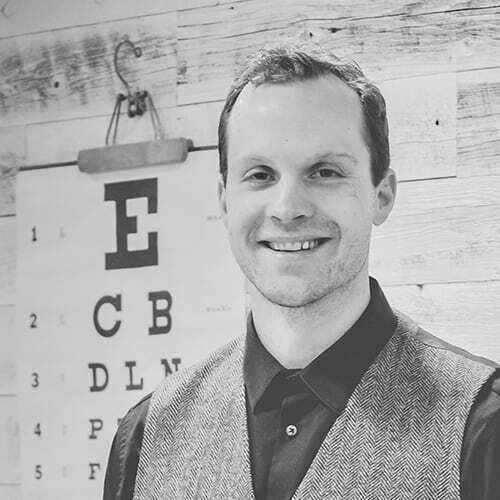 Dr. Frank is a member of the Alaska Optometric Association, American Optometric Association, Vision Source, and is a provider for the renowned InfantSEE program. Aside from spending quality family time with his wife and young sons, Dr. Frank is an avid outdoors-man. He enjoys reaping all the benefits of living in the Last Frontier – especially hunting and fishing. His goal is to add aviation to his list of interests in the near future.